It’s often hard for bands to come up with something that feels innovative, yet is still relatable to a larger audience. Ontario’s Red Handed Denial have been pushing forward for a decade with a sound that does exactly that. It’s hard to really put a place on it, but it manages to balance both the proggy/technical aspects that metal fans crave with an incredible knack for both instrumental and vocal hooks. 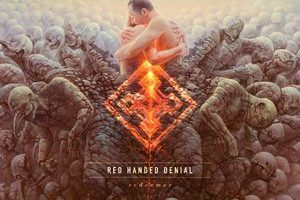 It’s both brutal and melodic, and their most recent release, Redeemer, serves as an excellent starting point for those new to the band – their strongest effort to date, and it also continues the story started with their previous EP, Wanderer. 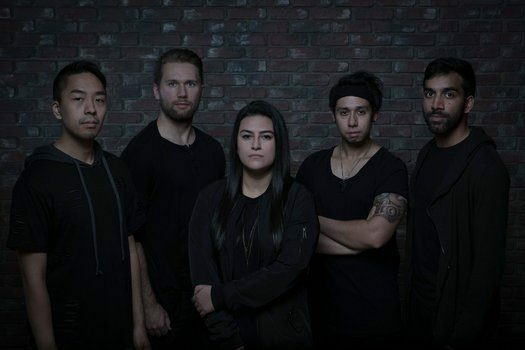 We got ahold of the band and got the scoop on their new album and much more from guitarist Chris Mifsud, vocalist Lauren Babic, and drummer Tyson Dang. Dead Rhetoric: With 10 years in the books, how do you feel Red Handed Denial has changed since it has begun? Dead Rhetoric: Given the vast influences in the music, how do you describe your sound? What do you feel is the band’s defining characteristic, if there is one? Tyson Dang: When it comes to our sound I think our characteristic comes from our ability to be creative and eclectic in all the songs we write. We aren’t bounded by how we should sound while we’re free to express how we want to sound. Each member loves a wide range of genres and artists and it really comes together when we’re writing songs. Our sound is a mixture of something sharp and something soft. Something to make you headbang one moment, and something to make you sing along the next moment. It’s memorable, it’s heavy, it’s us! Dead Rhetoric: Could you discuss the conceptual connection between Redeemer and your last EP, Wanderer? Lauren Babic: What initially inspired the Wanderer/Redeemer story was a lyric from “Oh, Prophecy”, a song off of our album Stories of Old: “in every man there is a demon, a demon waiting to be aroused by apathy and suffering”. Stories of Old is more rock inspired and deals with the fairy tale/hero’s journey theme, so when we began writing for Wanderer, I wanted to create a world surrounding a villain or anti-hero who due to circumstance, goes from good to evil and eventually is the cause of their own demise. The “good vs. evil” theme and the archetypes that surround it have always been fascinating to me. When explaining the concept I always like to parallel it with Walter White from the show Breaking Bad. Wanderer deals with the anti-hero’s mortal life: how they became the monster, how they became desensitized to doing bad things, and how their deeds eventually caused their own death (literally meeting Death himself in the song “Collector”). Wanderer ends with a massive cliffhanger in the album title track; the anti-hero slips into limbo as their mortal life fades away…then what happens?! Redeemer happens. Without giving too much away, Redeemer is the post-mortem journey of how the anti-hero finds their way to the afterlife, but not before coming to terms with everything they’ve done during their life. I’ll eventually do an in depth track-by-track of the entire story after Redeemer has been out for a bit! Dead Rhetoric: Given that it is a concept album, how much forethought is given into the flow of the album and how tracks connect to each other? Lauren Babic: It was a lot of flowcharts and storyboards! I wanted to dig very deep into how we could tell the story lyrically and instrumentally. Everything on the record has a reason as to why things are the way they are. There are really cool callbacks to Wanderer on the record, some very obvious but some very subtle. I’m excited to see people discover them and dissect the songs. Dead Rhetoric: What does your general songwriting process look like? Chris Mifsud: With this album the writing usually starts with the guitar. I usually put together some riffs while being mindful of a general arrangement. Further arrangement of the song and additions come after. More guitar work from Aleksei, Tyson’s drums, Dom’s bass and Lauren’s vocal ideas come last. I did a lot of experimenting this time around with different guitar tunings. Instead of using a regular drop tuning I tried some variations like GGCFAD. A lot of heavy ideas just kinda evolved from these alternate tunings. Dead Rhetoric: Given the apparent uptick in heaviness on this album, how important is the contrast with melody? Lauren Babic: I think it’s very easy to become very “onenote” in heavy music. For me as a listener, I always need melody to capture my attention and draw me in, especially in the vocals. For Redeemer, it was very clear the album was going to be heavy right off the get-go, so I wanted to make sure vocal melodies weren’t going to disappear and be replaced completely with screaming. I didn’t want to take the easy way out and just settle with that so I challenged myself to do what the song needed yet still provide the pop sensibility that RHD likes to bring to metal. Dead Rhetoric: How does the cover art tie into the concept? Lauren Babic: Breaking free of the inner-demons, letting go of the anger, accepting change, and emerging on the other side as a new person full of love! Dead Rhetoric: You had a collection of vocal help on “Redemption” and Andrew Ivashchenko on “Abdication.” What do you feel that they added to those tracks? Lauren Babic: Andrew is one of my favorite vocalists right now, and “Abdication” has some serious Shokran vibes. As soon as the song really came together, I immediately thought of Andrew being perfect for it. “Redemption” is such a rollercoaster of a song, and I think the choir is a wonderful pallet cleanser for the album! Dead Rhetoric: How did the band’s logo come about, and does it have a particular meaning? Lauren Babic: Visually, I was inspired by some old alchemy symbols. For us, the symbol represents the idea that the sum is greater than its parts. We are a very collaborative and democratic band, and no decision is ever made without each band member’s input. We’ve always been this way and I think it’s a reason we’ve been able to stick together for so long. Dead Rhetoric: How successful do you think that YouTube has been in getting eyes on the band, given some of you have solo content available there? Lauren Babic: I think Youtube has opened a lot of doors for myself and the band. How I see it, I want to help grow our family in whatever way I can and I think the covers I’ve released on my own channel and through CrazyEightyEight have contributed to Red Handed Denial as well. I love connecting the different projects I’ve been lucky to be a part of. In the end it’s one big happy family. Dead Rhetoric: What challenges have you found in trying to get Red Handed Denial’s name out there and expand it? Tyson Dang: Visually, we’re a band of different cultures, genders and ethnicities brought together by the same influences and interests. I pride ourselves over the fact we don’t quite look like you’re average rock band of 5 sweaty dudes with unkempt hair. Unfortunately those factors do play as a barrier when confronting the music industry. It’s true we’ve since came a long way with more notable females in music, as well as an abundance of musicians of different backgrounds. Still, they’re tougher to market for the general audience. The music we play is also a little tricky to market. It’s not often you hear harsh and “demonic” vocals on television or radio, and anything outside of the 4/4 time signature is a little too daunting for the listeners. Often times for new listeners it’s a bargain for them to hope they like what they hear. And in a market where it’s been incredibly easy to write and record your own stuff to upload onto the internet- we live in a digital age where everybody is either an instagram model or a soundcloud producer. Websites and social media outlets flood with songs after EPs after albums of material. It becomes increasingly difficult to “stand out” in modern music. Dead Rhetoric: Who do you feel would make good tourmates for you if you were given the option to pick for yourselves? Lauren Babic: It goes without saying that we’d love to tour with bands like Protest the Hero, Dance Gavin Dance, and Periphery. These 3 bands have been paramount to who we are as musicians and you can definitely hear their influences scattered through this new album. We look up to these bands a lot and if we ever had the opportunity to tour with any one of them, we’d be elated! Dead Rhetoric: What is next down the road once Redeemer has released? Tyson Dang: Before we wrapped Redeemer in studio we had started writing new songs. As we approach the release day I’m happy to announce we have more than enough material to supply for a new album. One even more focused as a band.